Welcome to GAMERZONE! A new column from Dave Harlequin by-gamers, for-gamers at Nerd Nation Magazine. 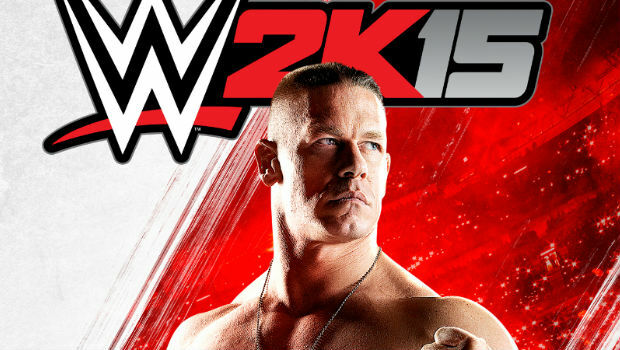 For his first installment, check out Dave’s review of 2K/Yukes’ WWE 2K15 for Xbox 360/PS3! On October 28, 2K Sports (alongside developer Yukes) released WWE 2K15, the latest installment in the highly popular WWE video game series for the “last gen” consoles: the Microsoft Xbox 360 and Sony Playstation 3… with “next/current gen” consoles: the Microsoft Xbox One and Sony Playstation 4 set to receive their own (much different) versions of the new title on November 18. Professional Wrestling, love it or hate it, is one of the most popular forms of entertainment in the world today. The staged-yet-very-physical, hard-hitting-yet-pre-determined circus of violence, drama, and larger-than-life athletes has enthralled audiences the world over for decades and decades. Coming to mainstream prominence in the 1970s-80s and exploding in popularity in the 1990s with such promotions as the World Wrestling Federation (now World Wrestling Entertainment/WWE) and National Wrestling Alliance (which paved the way for World Championship Wrestling, Extreme Championship Wrestling, TNA Wrestling, and others), pro wrestling was always a shoo-in for the video game market, and has remained one of the top-selling sports game genres throughout the years on nearly every major consoles ever released. – So, how does it stack up?? Triple H (left) and Shawn Michaels (right) square off in the new 2K Showcase mode. The gameplay is virtually the exact same as it was in WWE ’13 and WWE 2K14, which isn’t bad by any stretch, but has been in need of a bit of an overhaul, which it will receive in “next/current gen” versions, along with the highly-anticipated “My Career Mode” – which also is not supported on 360 or PS3. Both versions received the new “2K Showcase” mode which (much like the beloved “Attitude Era” and “30 Years of Wrestlemania” modes of games past) takes players through a series of historic matches/objectives spanning some of the greatest rivalries in WWE history – specifically the 2002-2004 rivalry of Triple H and Shawn Michaels and 2011-2013 rivalry of John Cena and CM Punk, with other expansions to this mode already planned for DLC. 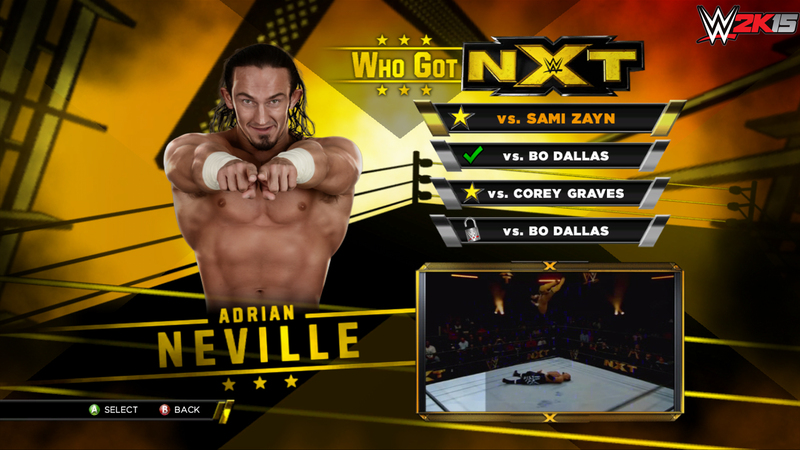 While 360/PS3 lacks the “My Career Mode” they were granted the “last gen” exclusive “Who Got NXT?” mode – which takes you through a series of matches from current NXT (the rookie/developmental league of WWE) wrestlers: Adrian Neville, Sami Zayn, Corey Graves, Alexander Rusev, and Bo Dallas. While it’s a nice touch, it’s also largely pointless, as this mode not only does not follow much, if any actual history, but also only features two current NXT wrestlers of the five available. In truth, it feels like exactly what it is, a cheap, second-rate consolation prize to make up for the lack of My Career Mode. “Universe Mode” – the main, never-ending player mode of the game, is virtually the same, with the inclusion of new story options for rivalries and some moderately improved commentary. The roster features many active/retired WWE/NXT talents, but has considerably fewer than any other game of recent years. 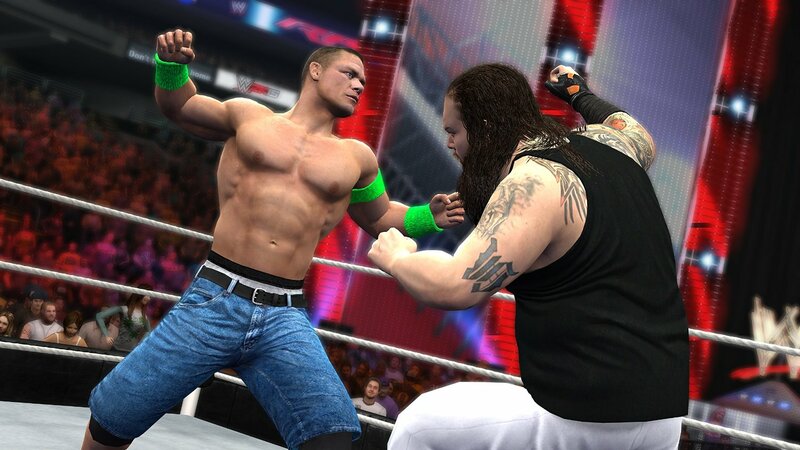 John Cena (left) and Bray Wyatt (right) square off in what appears to be “Exhibition” or “Universe” mode. Gone are the popular “Create-A-Story” and “Create-A-Finishing Move” features. Gone is the ability to import custom entrance music for your created wrestlers (which has already spawned a ton of hate online – including some by this writer), as well as the vast majority of pre-set custom entrances, move-sets, etc. The creation suite is a stripped-down, bare-bones version of previous incarnations, and has honestly just taken all of the fun out of what was, in my opinion, the best part of the games. Now, any custom creation will be inherently more generic, and the community-created inclusions of any wrestlers not featured in the actual game will not be able to feature their own entrance styles, music, or much of their personalities. It’s a lose-lose-lose for all creative types… many of whom have stated that they feel they are being punished for daring to do anything “unofficial” while others have speculated that this was a direct result of the severe freezing issues faced by players in 2K14. Regardless, it’s definitely a noticeable black mark on the franchise, which will undoubtedly cost 2K if it isn’t corrected, and soon. Overall, WWE 2K15 is a huge disappointment. The removal of some of the most popular features, limited roster, and the same price-tag for last-gen and next/current-gen consoles are all really low points in a franchise that had so much potential moving forward with 2K Games. I would highly recommend saving your money, and just skipping this one altogether. In fact, if you just need a wrestling game fix, pick up a used copy of WWE ’13 or 2K14… trust me, you’ll enjoy it more and spend less. Not nearly as good as previous years… not worth the price tag… and just not worth bothering with. Out of 63 wrestlers, 11 are valid Legends (though not all 11 are officially classified that way) and 7 are duplicates. Another 5 are gone (for various reasons) and 4 are injured. There are only 3 NXT wrestlers who are truly /just/ NXT (I don’t count main roster stars that work NXT). Since I don’t use Divas, I’m left with 33 official Superstars on main roster. If I divide that evenly between /Raw/ and /Smack Down/, I’m doomed to extremely repetitive booking. If I set both shows to 5 matches each, they use a minimum of 10 wrestlers per show. That’s weak. I’m going with just /Raw/ and a strong roster of 33 official plus however many custom wrestlers I can wring out of that bad joke of a creation suite. This will take quite a while, I know, but what else am I going to do over the long winter nights? DLC will also pad that roster over time (at least in theory; it’s entirely possible the majority of DLC characters will be more Legends and/or duplicates I do not want and will not use). Speaking of DLC: I bought the Season Pass so where’s my Paige? Amusing to note that the game upholds Vince’s fascination with “big men” (like the way custom wrestlers default to 6’5″ tall). Of those 33 official Superstars, there are no cruiserweights, 14 light heavyweights, 17 heavyweights, and 2 super heavyweights. I honestly wouldn’t expect a lot of super heavyweights, but /no/ cruiserweights? I guess I’ll just have to build an entire cruiserweight division myself (and I’m off to a good start with my Disciples of the Dragon stable). Also of note is that those 33 official Superstars make the roster heel heavy. For light heavyweights, it’s an even 7:7 split. For heavyweights, heels outnumber faces 11:5, and that’s /if/ I carry Orton as a face since he’s turning soon. There are no heel super heavyweights, but that will change soon; you know they’re setting up a Henry/Show feud. Overall, heels have a 19:14 advantage in numbers. I’ll enjoy fixing that with customs, but it annoys me that it needs to be fixed. I /might/ use Divas in the future /if/ they release enough to support a show of their own, but I doubt WWE will /ever/ have a Diva roster big enough to make Divas anything more than an amusement (how I dearly miss Lita). That /Total Divas/ is even a thing convinces me that WWE has absolutely no plans whatsoever to take women wrestlers and women’s wrestling seriously. Not surprisingly, if I want a decent Divas division, I will have to build it myself. It won’t be official game content. Which brings me to my beloved Tag Team crusade. Those 33 official Superstars leave me with just 5 teams: the Usos, the Dust Brothers (though I need Stardust, not CoRho), Rybaxel (though must be created via “Edit Teams”), R-Truth/Woods, and the Wyatt Family. That’s it. That’s all I have after eliminating teams that have already broken up and/or I won’t use anyway. Again, this means more work for me as an amateur custom wrestler creator. I have to build my own Team division. So yeah. I’m just /loving/ this new stripped down bare bones creation suite. LOVING it, I tell you.